In my opinion VIPERTEK makes the best stun gun flashlight that’s reasonably priced. This little thing will drop a grown man to the ground almost instantly. Its sharp spike electrodes allow it to penetrate and deliver a high effective stun even through clothing. 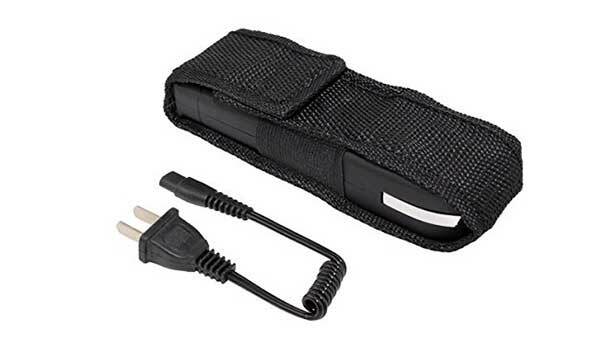 This is a small little stun gun that can easily fit into a purse. They can place it in their purse and forget about it unless a situation comes up when they feel uneasy. The sides of the device have shock plates, so if someone tries to grab it out of their hand they will be hit with the devices high voltage shock. It also doubles as a flashlight, so if they need to find they keyhole at their apartment at late at night they will be able to do so while they have a self-defense tool in hand. This is a great self defense gift for girlfriends, wives, or anyone that could use a handy self-defense flashlight with a stunner. The LED light is very bright, and the entire device is rechargeable. It is recommended to charge the device for 1-2 hours per month even if it is not used.